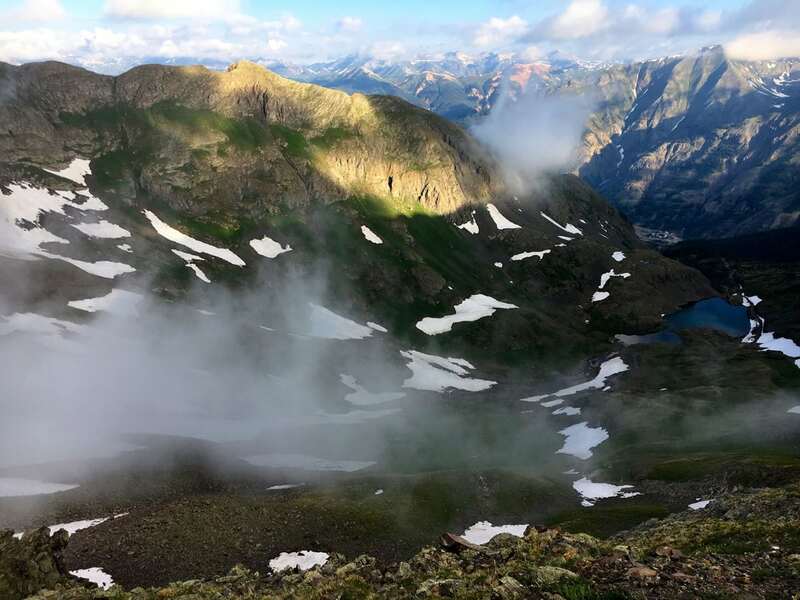 The 2017 Hardrock 100 was run in challenging conditions, which included a severe storm for most of the field on the first day, an injurious fall for Spaniard Kilian Jornet (pre-race and post-race interviews), and a brief interlude of getting lost by France’s Caroline Chaverot (pre-race and post-race interviews). No matter, these two rose from those challenges to win via their own commanding, but very different performances. In the men’s race, Mike Foote (pre-race interview) took second for the third time, and Joe Grant rounded out the podium after a couple recent rough goes at Hardrock. In the women’s race, Darcy Piceu (pre-race interview) landed her fourth second place and her seventh finish in first or second here, and France’s Nathalie Mauclair (pre-race interview) overcame the challenges of living at sea level to round out the women’s podium and finish her first Hardrock. 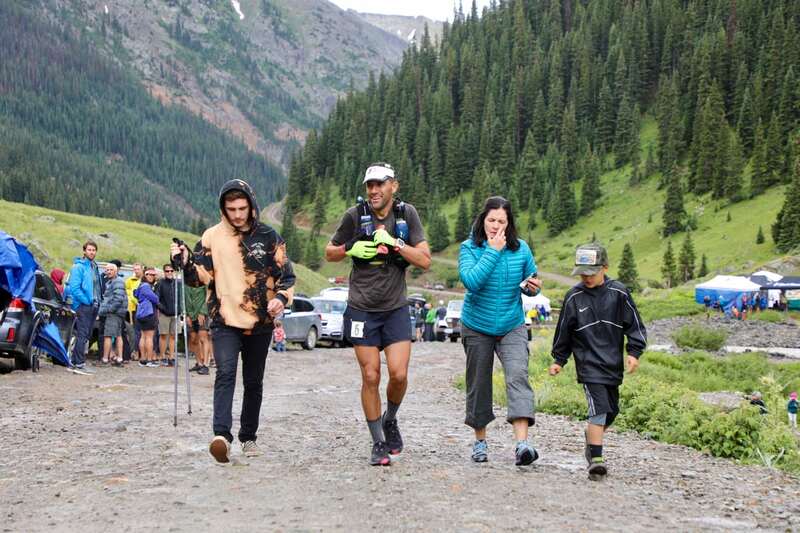 In the end, 126 runners among the 145 starters completed the tough mountain circuit made up of more than 33,000 feet of climbing starting and ending in Silverton, Colorado. The final few runners reached the finish line during the last hour of the race–between 5 and 6 a.m. Sunday morning–before the 48-hour cutoff. The final 2017 run finisher was Robert Andrulis, who in crossing the line completed his 10th Hardrock. A special thanks to Smartwool for making our coverage of the Hardrock 100 possible! Thanks also to Altra for their support of our Hardrock coverage. If there is such a thing as Hardrock loving Kilian Jornet (pre-race interview), then there might also be such a thing as Jornet loving Hardrock. The now-four-time champ, who is arguably the world’s best mountain athlete, could undertake pretty much any race or expedition he wants, anywhere in the world, anytime, and yet he returned for his fourth outing around the 100.5-mile Silverton-and-back-to-Silverton loop through the remote San Juan Mountains of Colorado. That’s gotta’ say something about an event. Like in previous years, Jornet went out with whatever runners set the pace. In this case, it was Caroline Chaverot at the very start and Iker Karrera (pre-race interview) soon after. Jornet and Karrera would work together and run near to each other until Ouray, at mile 57. 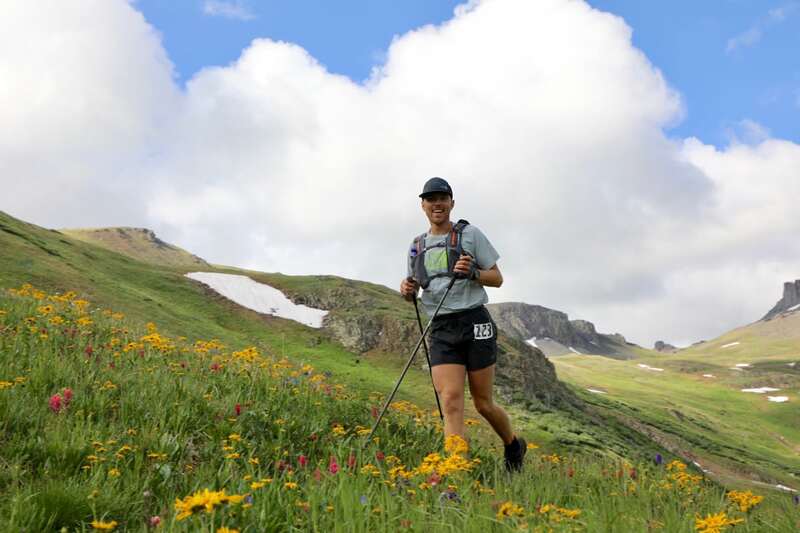 Around mile 14, as Jornet dropped through a steep snow patch off Buffalo Boy Ridge and into Maggie Gulch, he took a head-over-heels–actually a couple times, as he recalled post-race–tumble. In an interview with us after the race, he said he was looking around instead of at where he was putting his feet, punched through the snow and into rocks, and rolled. This dislocated his left shoulder and opened a couple small flesh wounds. Jornet explained that he has a problem with dislocating that shoulder after several previous similar injuries in skiing and climbing, and he also said that he then used his other arm to re-locate his humorous bone where it should be inside his shoulder joint. Yep, on the mountain, with some 85 miles yet to run. His pain eventually began to bother him, especially on downhills due to the jostling and bouncing involved in downhill running. At Grouse Gulch, mile 42, he asked for it to be taped immobile against this body, the way he’d then carry his arm for 58 more miles. A significant shoulder injury was still no match for Jornet. After sharing the relative lead with several runners until the KT aid station at mile 89, Jornet easily accelerated on the long, final climb, gapped everyone else in the field, and finished some 22 minutes ahead of any other man. His 24:32 is his slowest of his four Hardrock finishes, perhaps a reflection of how an injured arm slowed him down at least a little bit. Early pace setter and lead sharer Karrera ran in or near to the lead for the race’s first 57 miles. He looked calm and collected, and especially able on the steep, off-trail, and little-trailed downhills which frequent the course. However, he would become beset by stomach issues that required him to hole up in the town of Ouray, mile 57, for almost 90 minutes. Eventually, they would abate enough that he would be able to forge ahead, though several positions back and at a slower pace. Leaving Ouray, he exited as fifth man. He would mostly run in this position until about a mile from the finish where he was overtaken to finish in sixth place. Mike Foote (pre-race and post-race interviews) knows how to run Hardrock. Patient, even-keeled, and chill-but-focused seems to be his winning psychological recipe in addition to wicked physical fitness. All day long, it seemed, Foote ran in contact with the lead. The guy was just always right there. A couple cases in point, at Maggie Gulch (mile 15), Engineer aid station (mile 49), and at Ouray (mile 57), he remained just five minutes off the lead. At the mountain town of Telluride in the western San Juans, mile 73, Foote left the aid station in the lead, but with Joe Grant (post-race interview) and the always looming Jornet right there. From mile 73 to mile 89, Foote kept in close contact with eventual winner Jornet. Though Foote was no match for Jornet in the final 11 miles, the rest of the field was no match for him and he finished some 43 minutes ahead of everyone else. Three times a second-place finisher for Foote, in 2009, 2015, and this year. Similar to Mike Foote but a bit more loosely, Grant ran in comfortable contact with the lead from the start to very near to the finish. 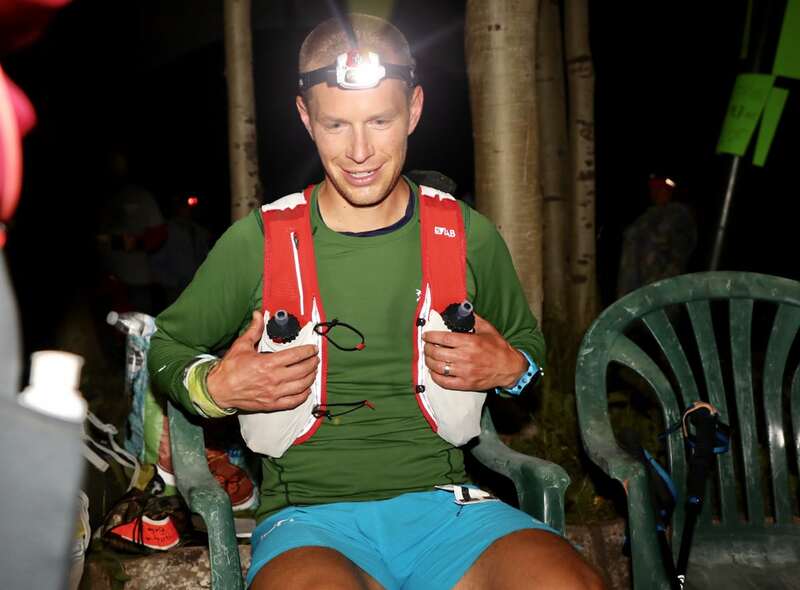 Let’s take a look at the same aid stations we examined with Foote: at Maggie Gulch (mile 15) he was eight minutes back, at Engineer aid station (mile 49) he was 17 minutes back, and at Ouray (mile 57) he was full-on sharing the race lead with Jornet. 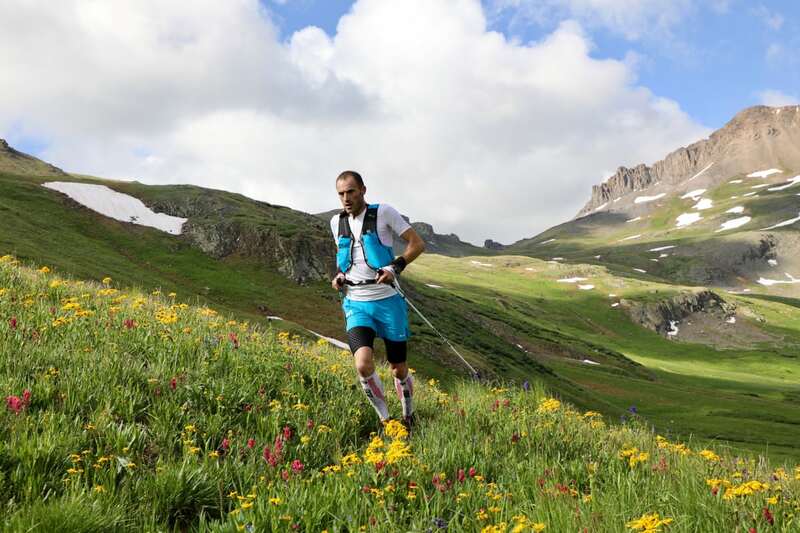 After Ouray and up until Chapman Gulch at mile 82, Grant remained in very close contact with the lead. He said after the race that he suffered the final climbs especially, though he remained capable on the downhills. He would roll over the finish line in third place. Wyoming’s Gabe Joyes is a strong regional runner with solid credentials at tough ultras in the Rocky Mountain West, though he remained untested among a more competitive stage like this one. Very early in the race, Joyes placed himself among the top-10 men. For example, at mile 15 in Maggie Gulch, he was in seventh place. Throughout the race, he’d ride the waves of positions in the middle part of the top 10, while generally trending downward in position. His fourth place and sub-27-hour finish seal the deal on his street cred for playing with the big guns of mountain ultrarunning. Nick Coury played the race super smart, moving up from well outside the men’s top 10 in the race’s first third, to sixth position with a mile to go. There, he accelerated past then-fifth-place Karrera to finish in the fifth position and for his fourth Hardrock finish. 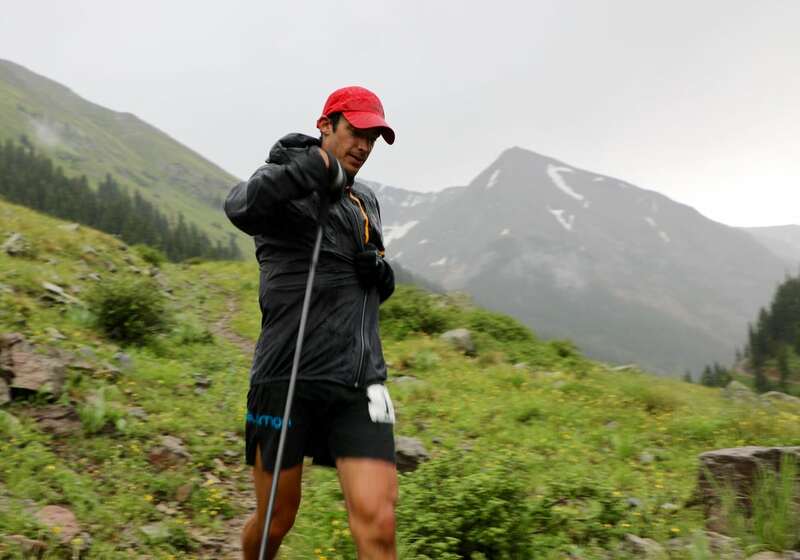 Notable among the men’s field, co-defending champion Jason Schlarb (pre-race interview) dropped in Cunningham Gulch, just nine miles into the race, following a couple days of gastrointestinal illness. Both Coury brothers finished inside the top 10, with Jamil Coury earning eighth place among the men. Scott Jaime finished, earning his 10th Hardrock completion in 11 tries at the event. Blake Wood earned his 21st finish, and Kirk Apt took home number 23. I’ve never seen someone race quite like Caroline Chaverot (pre-race interview) does, with such singular focus, at such incredible intensity, and for such a lengthy period of time–in this case, 28.5 hours. She led the women’s race from start to finish. Let’s be clear, she took the men’s race out hot, too. A half mile into the race, Chaverot full on led the entire field and as far as Maggie Gulch, mile 15, she ran at men’s—not women’s—course-record pace. By the next time we saw Caroline, in the former mining outpost of Sherman at mile 29, she’d notably slowed from her previous efforts of keeping nearly with the men’s leaders, but was still running well under women’s record pace. In fact, at Sherman, she was 12 minutes up on the women’s course record. 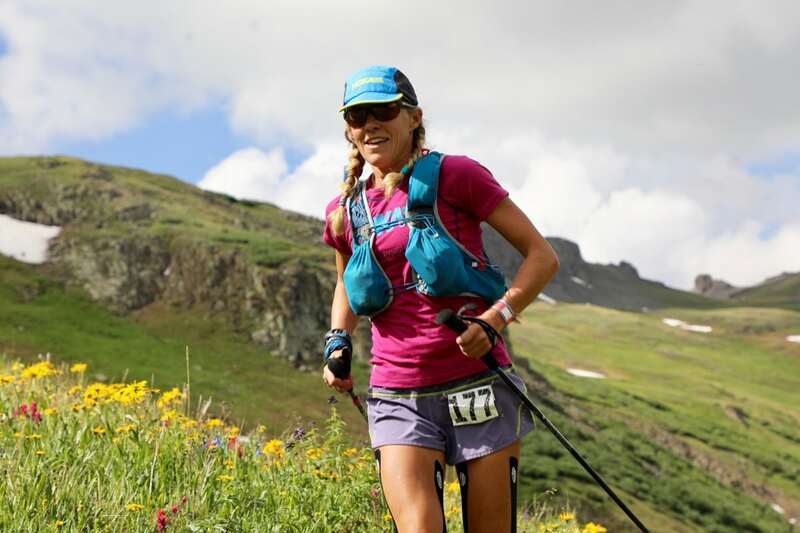 She increased that time between there and Governor’s Basin, mile 64.5, what amounted to the race’s middle third, where she was 34 minutes ahead of women’s course-record pace and perhaps most meaningfully, only 23 minutes behind the lead men! Let your mind wrap around what it means to have a woman running just 23 minutes back of a guy called Kilian Jornet some 65 miles into a race. Unreal effort on Chaverot’s part. What happened next was something for the storybooks. First, she had a noticeable slowdown episode climbing the three miles from Governor’s Basin to Kroger’s Canteen, arriving to the latter just 19 minutes ahead of record pace and now 29 minutes behind the lead men. By all accounts, the slog up to Kroger’s was messy and slow this year due to rotten snow—everyone’s splits recorded slow ascents here—but Caroline ascended these three miles slower than the peers with whom she’d shared the trail this day so far. Then, about a mile after Kroger’s Canteen, where the route climbs out of the head of Marshall Basin and into the head of Liberty Bell Basin via the Mendota Saddle—a small pass—Caroline missed the saddle and descended about 1,200 vertical feet into Marshall Basin before apparently noticing her mistake and retracing her footsteps back to the saddle and onto the course. All in all, it appears she was off course for a little over an hour, but it also appears that the episode disturbed her psychology for the balance of the race. She was visibly angry at the next aid station of Telluride and clearly somewhat disappointed with herself as late as the finish. Caroline would close the final third of Hardrock strongly. 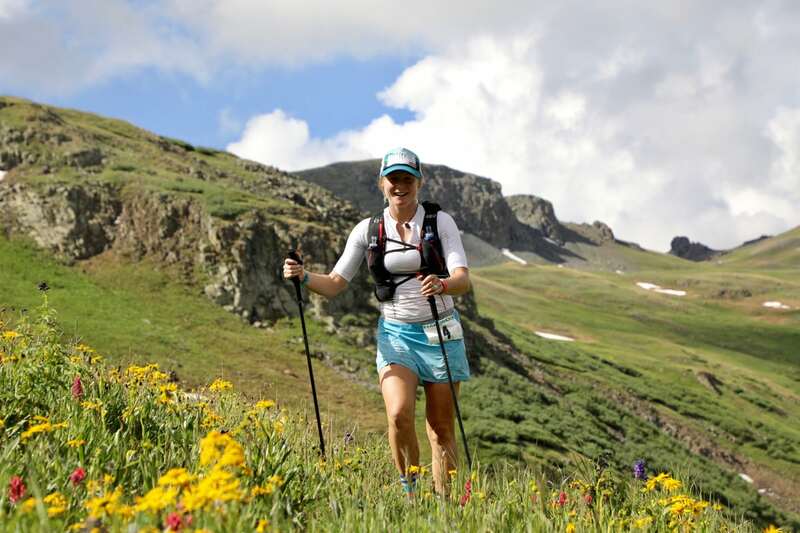 In the 27 miles from Telluride back to Silverton, she would not approach her previous pace as the men ahead of her increased their gap on her and her pace was now slower than women’s record pace, but she also remained untouchable by the rest of the women’s field. Her best competition in the race’s final third was from second-place Darcy Piceu (pre-race and post-race interviews). In Telluride, Piceu rolled through 66 minutes off the lead. At the finish, she was 51 minutes back. Though Piceu cut into Chaverot’s lead by 15 minutes in 27 miles, Chaverot was too far in front and still moving too well to be caught. As a result of her dominating performance and despite her off-course time, Chaverot won the 2017 edition of the race in the third-fastest time in its storied history. Simultaneous to Chaverot’s off-the-front efforts, a strong competition between Hannah Green, Anna Frost (pre-race interview), Piceu, and Nathalie Mauclair (pre-race and post-race interviews) ensued for more than half the race. As late as Ouray at mile 57, this foursome was split by only 31 minutes—a miniscule amount of time in a race such as Hardrock. On the long and enduring 4,000-plus-foot climb out of Ouray up to the mile 67.5 high point of Kroger’s Canteen, Green began to struggle and lose contact with the group while Piceu moved into the group’s leadership position, breaking off the front of it and gaining a 20-minute lead over the rest of the women. This is a position that Piceu would not only hold steady in during the race’s final third, but also increase her place in. That is, when she crossed the finish line back in Silverton in second place, her closest chaser was 72 minutes back. Of note is that Piceu also was among the few Hardrock runners to race without a pacer the whole time. With her second-place finish, she brought her lifetime Hardrock statistics up to three wins and four second-place finishes. France’s Mauclair says that her race was limited by the altitude, and that she had to move more slowly than she would have liked. 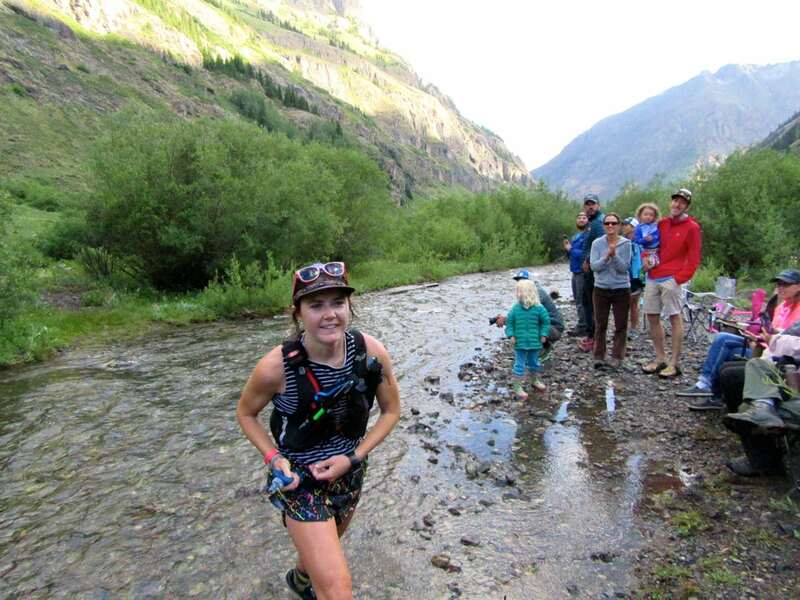 Early on, such as when we saw Mauclair at Maggie Gulch (mile 15), Sherman (mile 29), Grouse Gulch (mile 42), and Ouray (mile 57), she ran in the fifth position, but she was in clear contact with and a part of the pack of second-through-fifth-place women. 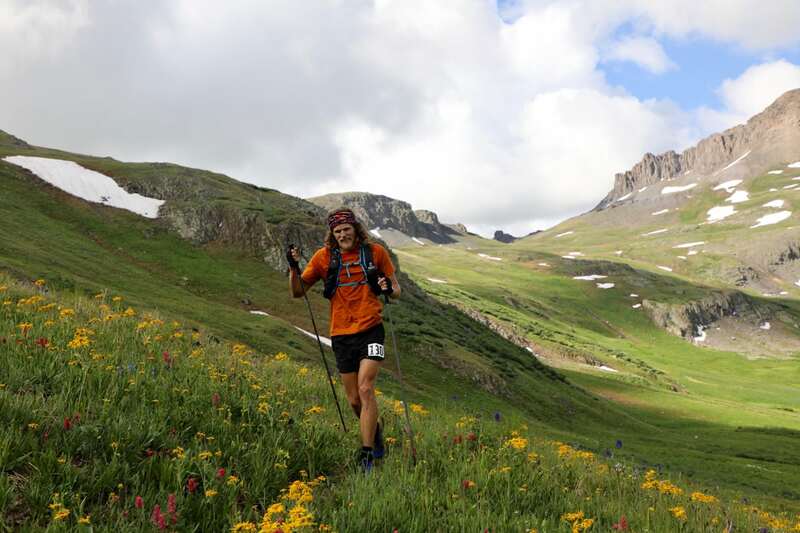 Between Ouray and Telluride, mile 73, Mauclair ticked up a position from fifth to fourth place. Then, she arrived into Telluride in fourth while then-third-place Frost was there, and left in third place. 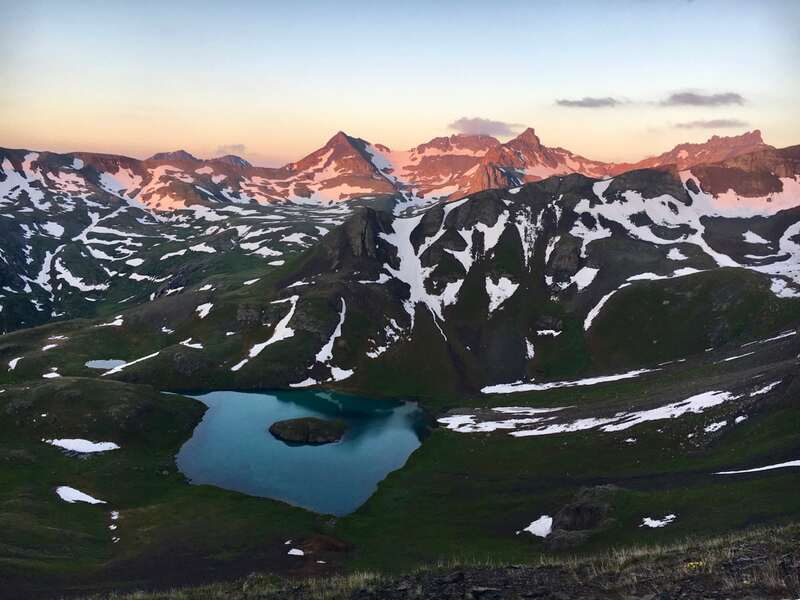 The back-and-forth effort between Mauclair and Frost continued, with Frost overtaking Mauclair atop the climb after Telluride, Oscar’s Pass, before Mauclair overtook Frost and arrived to the mile-82 Chapman Gulch aid station with a four-minute lead over Frost. From there, Mauclair would hold and then increase her lead over Frost to finish in third place. What she described at the finish line as a long battle which involved perhaps just the right amount of suffering, two-time defending champion Frost emerged as this year’s fourth-place finisher. Becky Bates rounded out the top-five women. Green, who early on influenced the women’s race and who eventually took a long rest before continuing on, finished in seventh place. Notable among the women’s race, Darla Askew earned her fifth finish, Tina Ure her sixth, Liz Bauer her ninth, and Betsy Kalmeyer her 18th! It takes a huge team to bring you the coverage we did! Thanks to all our volunteers in the field: Eliza Hamm, Marissa Harris, Vince Heyd, Roch Horton, Charles Johnston, Ryan Koch, Sherri Philips, Mike Place, Denise and Justin Ricks, Ashley Saloga, and Kim Wrinkle. Thanks, as well, to Mauri Pagliacci for his office support from Argentina. Our CoverItLive discussion would not have been possible without the help of Jon Allen, Ellie Greenwood, Andy Jones-Wilkins, Travis Liles, Aaron Marks, Mauri Pagliacci, Travis Trampe, and Dani Torres. Thanks so much to all for the amazing Hardrock coverage. I love to live vicariously through all the runners every year. You guys do an amazing job of bringing these mythical mountains to little coastal Connecticut!! has the complete runners list and results. Congrats to all that soldiered on that 2nd night! What happened to Karl Meltzer that he had to stop at Ouray? He had a rough time from the start. Called it a day. Thanks so much for your coverage and love of the sport! I’m sure you’ll catch this but in the notes on Darcy it says, “she brought her lifetime Hardrock statistics up to three wins and four fourth-place finishes.” Should be four second-place finishes! Thanks. That’s what we meant… but, lack of sleep! ;-) We’ve made the correction. So, Kilian can still kill it at HR with one arm tied behind his back! An amazing athlete for our time. Everyone who finished has my awe and utmost respect. Thank you irunfar.com for the coverage, another epic HR in the books. Being a fan of Kilian myself, I wonder if it’s a responsable decision from any organization to let any athlete (pro or amateur) continue in such physical conditions for that lenght of time, distance, etc. I know what Killian did it’s just out of this planet but it wasn’t a survival thing, just a race… I don’t know, just trying to make my mind around this situation. Great coverage as always, Meghan. Here’s another link to OpenSplitTime that will give you a “big board” presentation showing all the splits for all runners: https://www.opensplittime.org/events/hardrock-100-2017/spread. I was given the honor of pacing Betsy Kalmeyer from Chapman to the finish this weekend and I’ve never seen such an incredible display of determination and strength. Going from spending 4 hours on a cot at Ouray barely able to hold her head up and unable to keep anything down to seeing the way she pushed harder and harder every mile we got closer to the finish line has completely changed the way I define toughness. She’s an unbelievable inspiration and there is no question as to how she has managed to finish this beast 18 times. Betsy is an absolute legend! First, my admiration to everyone who started the race, those that finished and those who didn’t. That said, and I don’t mean to be disrespectful, but the fact that Kilian can control the race while running 80 miles with a dislocated shoulder, choose when to attack and leave his competitors behind to go and win with authority, it puts into evidence that, while full of very accomplished ultra runners, it just wasn’t a very deep field. I know that Killian is a beast, but had this happened at this coming UTMB edition, he wouldn’t have had a chance. Which makes me wonder, as much as Kilian’s feat needs to be celebrated, shouldn’t we pay equal attention to what it says about the current state of the Hardrock 100? That Hardrock 100 is a 144-runner event that doesn’t build or bill its field as being the most competitive. I believe it took Kilian three years of applying before he ever got in. By questioning the “current state” of Hardrock, it implies that you prefer a “previous state” of Hardrock. Hardrock and UTMB aren’t comparable in any way. I guess they are similar this year in the fact that Kilian is going to run both of them. I don’t see the point in whether Hardrock has a “deep” field or not. Although I’ve never participated in the run (I hope to one day), I don’t think the competitiveness of the field is what it’s all about. Thanks so much for the coverage. Great recap, Meghan. I, too, would “give an arm” to keep up with Caroline Chaverot.